which he titled "the first wacom tablet." 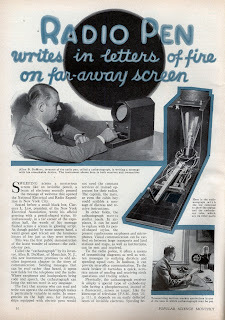 This actually got me thinking about my early work with light pens and digitizing devices. 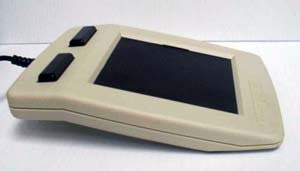 I'll save light pens and touch screens for another post, but one of my first "digitizing tablets" worked on a similar concept. 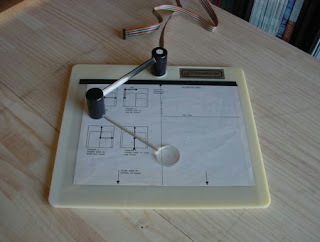 The "Versawriter" used the standard potentiometer inputs of the Apple ][ and put them on the hinges of a sort of pantograph. I can clearly remember the long hours spent tracing over illustrations to get them in the computer. Later came the Koala Pad. We'd seen the early mouse interfaces by this point, so the other developers and I created some drivers that would let you control a cursor using drag motions on the Koala Pad.